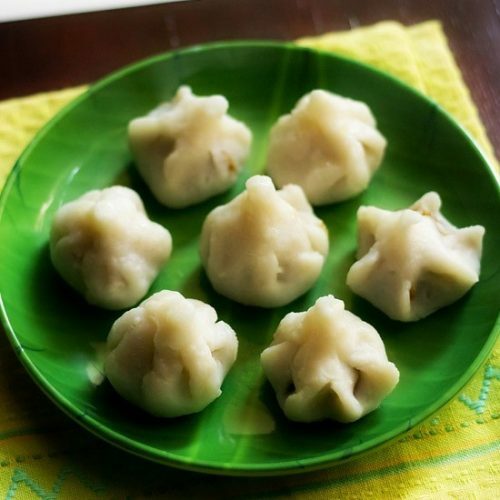 ukadiche modak is a traditional maharashtrian steamed sweet dish offered to lord ganesha on the occasion of ganesh chaturthi festival. heat ghee in a pan. keep flame to a low. add poppy seeds, cardamom powder and nutmeg powder. saute for some seconds till poppy seeds start crackling. then add grated fresh coconut and powdered/grated jaggery. mix well and cook this coconut-jaggery mixture on a low flame. the jaggery will melt first. stir at times and cook this mixture till the moisture from the jaggery begins to dry. switch off the flame. don't overcook as the jaggery then hardens. keep this coconut-jaggery filling aside. on cooling the mixture will thicken more. you can also add a bit of rice flour to this mixture. this is an optional step. the rice flour helps to absorb moisture, if any from the filling. in a pan or dekchi add the water, oil and salt. keep it on the stove top. let this mixture come to a boil. reduce the flame and add the rice flour gradually. quickly stir and mix the flour with the water. stir till all the rice flour is mixed with the water. switch off the flame. remove the pan from the stove top and then cover this pan with a lid for 4 to 5 minutes. now take all the dough in a plate/thali or in a bowl. gather the dough together and begin to knead it. the dough will be hot when, you begin to knead. so apply some water on your palms and knead the dough. knead the dough very well. if you feel the dough looks dense or hard or dry, then just add a few teaspoons of warm water and continue to knead. make small balls from the dough. roll the balls till smooth in your palms. you can also apply some water on your palms, while rolling the balls. keep the balls covered with a kitchen towel. the balls should be smooth in appearance and should not have any cracks. before you start shaping the modak, keep water for steaming in a pan. grease the steamer lightly with oil or ghee. take a ball and flatten it with your fingers to a round disc or a shallow bowl shape. you can apply ghee/oil in your palms, while flattening. place the modak filling in the center. bring together all the edges and join them. remove the extra portion of the dough from the top, if any. shape and taper the top of the modak with your fingers. make all the modak this way. keep them in a steamer pan. cover the pan with a lid and steam for 10 to 15 minutes on a low flame. some modak may crack whilst shaping or steaming, buts its alright. you can forgive yourself if you are making this first time. once the modak are steamed, drizzle a few teaspoons of ghee on the modak. the ukadiche modak are ready to be offered to lord ganesha.